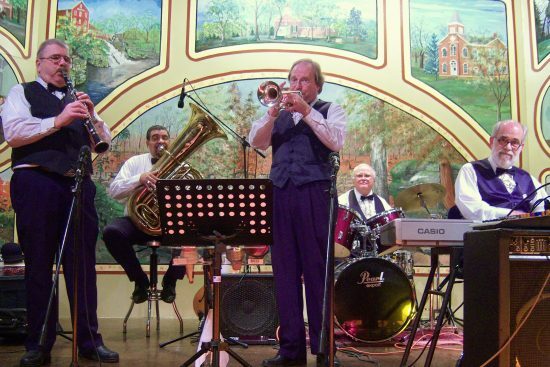 Razzamatazz & Jazz is a group of talented musicians dedicated to preserving a unique style of American music…Dixieland Jazz. Their energetic performance brings a spirit of celebration to any festivity. Their musical impersonations will put a smile on your face (close your eyes and you’ll swear it’s Louis Armstrong…in person!) and their brisk rhythms will start your toes a tappin’. This troupe of energetic performers has been entertaining audiences since 1978. One of their earliest appearances was performing on a weekly basis at Schmidt’s Sausage Haus in Columbus, Ohio, and they were so popular that they were held over for 9 years! Besides entertaining at venues like 94th Aero Squadron, 55 at Crosswoods and the Grand Victoria Resort & Casino, Razzamatazz & Jazz have been repeat performers at numerous festivals including the Columbus Jazz & Rib Fest, Fairborn Jazz Festival, Englewood Arts Festival and at many summer concert series across Ohio.